Gorgeous new fabric called Fila designed by Suzanne Tick for Knoll Textiles. Even if you didn’t have a chance to see the recent exhibition of Knoll textiles at the Bard Graduate Center in New York, you can still access the information, imagery, and ideas it offered through a new book on the history of Knoll. Writer William Weathersby shared this post, which sums up some interesting news from Knoll. It’ll give you a taste of Knoll’s rich legacy as well as what it’s up to now. 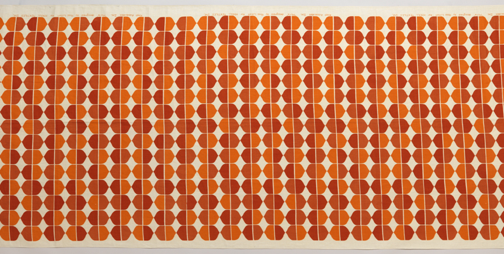 Color, pattern, technical refinement, and timeless style: that sums up the progressive history of textiles from the American manufacturer Knoll. Long renowned for its classic modernist furniture designed by icons including Bertoia, Mies, and Saarinen, the company remains a trailblazer in innovative fabrics for the home and office. But the thread of the fabric story, so to speak, and its rich history swathed in six decades of sensational swatches, has been somewhat obscured until now. 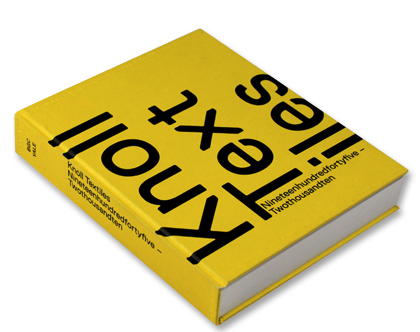 Following on the heels of a recent, groundbreaking exhibition at the Bard Graduate Center in New York, “Knoll Textiles, 1945-2010,” is a companion book just out from Bard in collaboration with Yale University Press. A survey and compendium with enlightening essays and more than 200 examples of textiles, furniture, interiors, and ephemera, the book tells the inspiring American success story of how one woman, Florence Knoll, largely shaped notions of modern interior style that have reverberated in our culture for more than a half century. The pioneering use of new materials and a commitment to innovative design have remained the company’s hallmarks today. Knoll Textiles creative director Dorothy Cosonas, who designs most of the company’s fabrics and introduces about six collections a year, recently has looked to the world of fashion to spark new ideas: high-end clothing designers Rodarte and Proenza Schouler have designed gossamer, shimmering, and tactile textiles perfect for draperies or upholstery for a line called Knoll Luxe. 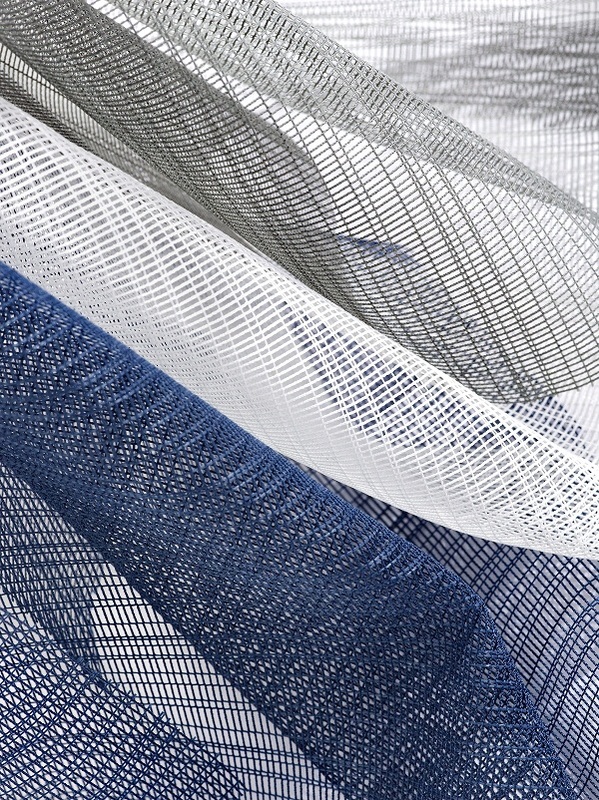 Meanwhile, designers such as Abbott Miller (a graphic designer) and Suzanne Tick (a weaving/fiber expert) have orchestrated new fabrics and wallcoverings that showcase elements from intricate patterning to textural complexity, yet always displaying Knoll’s commitment to the joy to be found in good design. 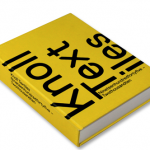 The new Knoll Textiles book. 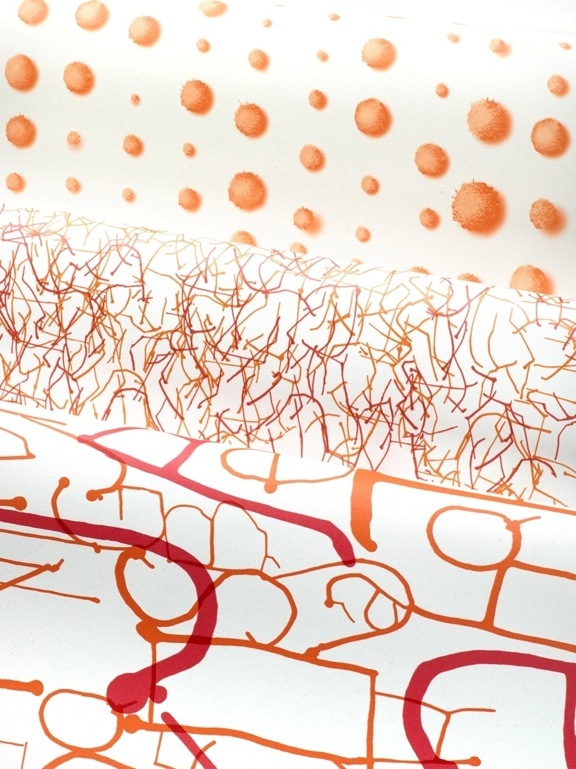 A sampling from the Ink Collection, very fun new wallcoverings by Abbott Miller for Knoll. 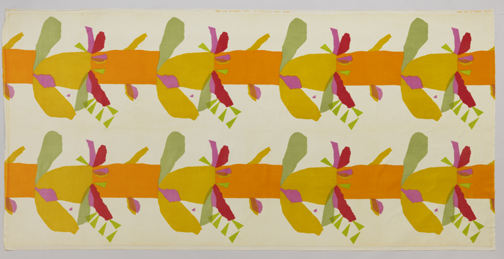 A textile from Knoll’s archives.